AQ Refreshment Centre serves all kind of refreshment items. 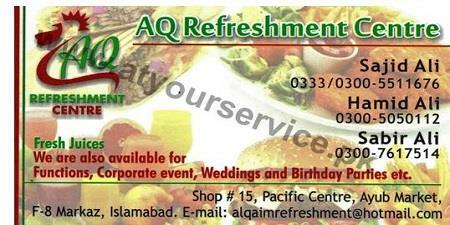 AQ Refreshment Centre is located in Pacific Center, Ayub Market, F8 Markaz, Islamabad. It serves all kind of refreshment items. It is also available for functions, corporate events, weddings and birthday parties etc.